Classroom Organization Tips • How I Stay Organized! Home ORGANIZATIONClassroomHow I Stay Organized! I’m super excited about Wednesday’s “Meet the Teacher Week” topic. Do you see that? 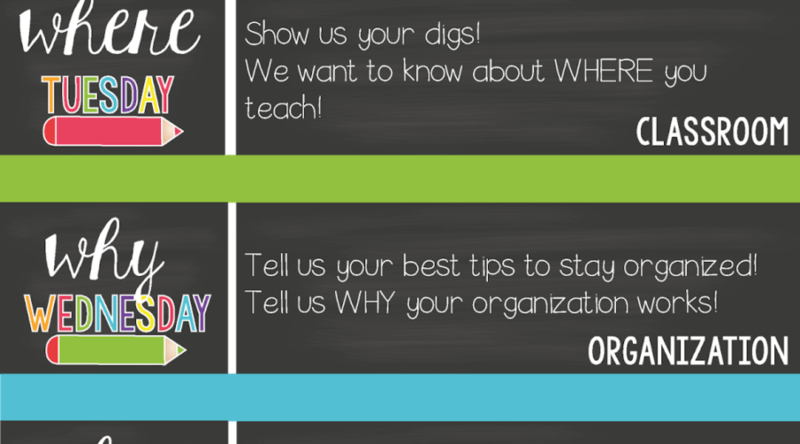 It says ORGANIZATION for Why Wednesday! I could talk about it for hours. And have. And you are probably sick of it… but I just can’t help myself. Plan a month at a time. Plan each month around a unifying theme (think social studies or science standards here) or two to bring cohesiveness to your days and weeks. This is a perfect way to fit in social studies and science into your busy, busy day. An organized binder is going to make planning for that month a breeze! Ok, so here are a few of the most common questions I received. Where do you put the binders? Isn’t copying a pain with plastic sleeves? No, it’s super easy. Lay the sleeve with the paper inside it on the glass and copy away. If you have something that normally is stapled into a packet, put the entire packet into one sleeve. Take that whole packet out of the sleeve when it is time to copy and back into it when you’re done. Easy/peasy. Plastic sleeves seem pricey, where do you get yours? I’ve always picked them up when I’m able to find them on sale. Sam’s Club, Costco and Amazon usually have fabulous prices on them, too. You don’t need super expensive sleeves. You aren’t going to be putting them through a lot of wear and tear. They hold up pretty well. I haven’t a clue how to start organizing my papers and I don’t teach themes and I teach content not holidays. Where should I begin? I start my organization with a year plan. I map out exactly which standards I am going to focus on during each month. In fact, if you are just starting an organization routing, I definitely suggest starting with mapping out your year plan. My “theme” for each month is actually a social studies or science standard. I use it as an overall “theme” so that I can be sure that content is addressed in all of our other subjects, too. It really serves as an organization tool for me and the brains of my little peeps. So, the binder for that month will address that science/social studies standard AND include items that address the standards that I will be teaching that month. Even if you don’t use “themes”, I would still suggest organizing your binders by month. Use your year plan to organize your material. Let that be your guide. Do you put EVERYTHING into binders? No. I only put things that I will need to copy or refer to in a binder. I toss extra copies into our “scrap paper” bin (the kids use that for all kinds of stuff). All other materials related to each month’s instruction are stored together in a cabinet. I have a container and shelf designated for each month. I try not to leave center items out longer than a month because the kiddos get bored. I am SO unorganized. I don’t know where to start. 1. Start with a year plan. Look at your standards. Look at your curriculum. Does your District have a scope and sequence or a pacing that they’d prefer you use? Lay that out so you can see it ALL at once… the whole year. Although you are going to hit many standards each month, you should have at least one primary focus standard in each content area each week. The year plan takes some time, but is WELL worth it. 2. Go through your files and papers. Toss the things that simply don’t appeal to you or are lacking. Group the things according to the “theme” or standard to which they apply. You should have 9 groupings – one per month. Use your year plan to remember what goes where. I hope I answered all of your questions, but PLEASE let me know your organization queries and concerns! It will definitely help me with upcoming presentations and blog posts! Don’t forget to check out the Blog Hoppin’ Linky …. all about ORGANIZATION ideas today! Love the binder organization! I hate file cabinets – giant bulks that take up real estate in my classroom! I am working on binders this year – I love your tips! Nice to meet you on the blog hop! I wish I had everything organised like that! I always promise myself I'll gather resources and file like this as I go each year so I am ready for the next and never do! Maybe this year now you've inspired me! I've been looking for a new organization method other than filing cabinets. Looks like binders it is! Thanks for the great idea! Wow! You have inspired me to take my organization to a new level! I love those white binders with all the spines looking so cohesive ! Thank you for sharing!